MoreBuilding a successful law firm starts with delivering high-quality legal services. Today, we represent clients from our offices conveniently located at 7810 McEwen Rd. Suite B. We are proud of our contributions to Dayton's history and the lives of the clients we have represented over the years. We are experienced. Our attorneys and staff have years of experience in satisfying clients. We do not just list areas of representation for show, these are disciplines in which we have excelled over time. We are effective. Our experience and skill has enabled us to resolve our clients' legal matters in case after case. We are aggressive attorneys and proven negotiators who seek, and deliver, good outcomes. We are a team. Many law firms operate as fiefdoms, with each attorney focusing on an area of law, independent of the others. That is not our way. From the receptionist who greets you at the door, to the attorneys and staff members we work together to help you define, and realize, your legal goals. It might sound odd for a law firm to claim that it cares about its clients ... or is it? 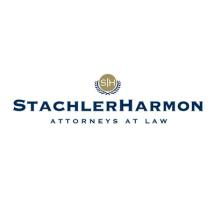 StachlerHarmon has thrived for generations because we understand that we are an important part of a community. By meeting with clients, listening to their concerns and delivering meaningful solutions, we do our part to ensure that our community will thrive and to set the stage for repeat business. For Personal Injury cases, we offer free initial consultations, including visiting your home or a hospital. For other practice areas, we offer free initial telephone consultations.